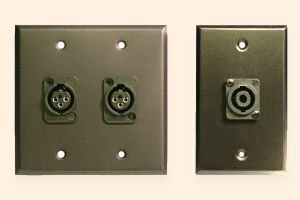 Whirlwind Wall Mounting Plates are cover plates designed to fit standard	electrical junction boxes. 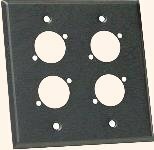 They are available in single gang (4-1/2" x 2-3/4")	and double gang (4 1/2"x 4-1/2") and we stock blank plates up to 7 gang. We can custom-punch to spec and offer complete high-quality engraving services. Refer to the following chart for part numbers of brushed stainless steel and black anodized aluminum. Note that blank plates are also available in .125" black or clear anodized aluminum. Plates include mounting screws. NOTE: "Punched for Whirlwind XLR" will accept male or female Whirlwind XLR, Whirlwind WCQF 1/4" TRS jack or Switchcraft "D" Series Connector (For example: WP1/1). "Punched for . . ." and "Blank" indicate that connectors are not included. All others include connectors mounted to the wallplate.